Nick Thomas writes: When scanning the various investment boards and forums on the Internet these days, it's obvious that most people have very low confidence both in the economy and the government's efforts to fix it. "Smoke and mirrors" is a common theme directed at the officials who are either woefully ignorant or blatantly lying about the worth of their existing "solutions" to the problems they face. There's a deep underlying suspicion of mainstream media cheerleading. The perception of the informed public is that the government's numbers are about as reliable as quoting the tooth fairy. The reason this kind of projection has no real credibility is because things continue to go from bad to worse in the real world. Economic pain and suffering increases by the day and I haven't read anyone outside the establishment cheerleaders who thinks things are getting better. U.S housing stats are weaker than expected. Nine banks have failed already this year. The government's only response is to add even more debt onto what we already owe and create ever more Byzantine regulations to apply band-aids over sucking chest wounds. Where there's smoke there's fire. People are starting to get angry and there is a deep suspicion that any government effort to rein in the 'too big to fail' banks is just for show. The latest Washington pronouncement is that retail-level banks would be banned from playing the markets via hedge funds and other risky vehicles. The government also likes the idea of imposing a cap on the market share of any one firm. Does anyone seriously believe that the banks – who just need to point a gun at the government's head and scream "We're too big to fail!" to get what they want – will actually get hurt by any of this? It didn't escape my notice that one of the biggest media-hyped 'outrages' that got extended play last year were the tempests over executive bonuses. In the case of AIG and a few others, these amounted to several hundreds of millions and were widely condemned as unjust rewards for incompetence (or criminality – take your pick!) and for driving their companies right over a cliff. Yeah, the outrage was appropriate, but did you note that all this outrage peaked just as the Powers That Be were still handing out your cash by the hundreds of billions in the meantime? It's just like a pickpocket distracting you with a ketchup spill on your shirt while his accomplice makes off with your wallet. Scream about millions while billions get looted from under your nose. On the message boards, some folks are openly wondering if the country will survive what's feared to be the worst economic drought since the Great Depression. In fact, there's a growing consensus amongst sophisticated investors that investing in the US now seems dangerous due to the looming budget deficit and weak financial institutions who are being coddled by a government too scared to implement truly tough (but unpopular) reforms. If that's so, where can you put your money? What is the safe bet? The Euro-zone is having a few problems right now. The PIGS (Portugal, Ireland, Greece, and Spain) are mucking up the Euro trough at the moment. Greece managed to issue about $13 billion in debt at auction, with almost $75 billion -- about 20% of its national GDP -- more debt to go later this year. If Greece doesn't get its money, its government goes bust and the Euro-zone has to cope with the humiliation of a member country's debt default. Whoops! That would certainly explain why the Euro has been dropping like an albatross over the last few weeks. China, the supposed 'next great financial power', is stuck within a popping bubble of its own and is trying to curb excessive lending. Its overall 'growth' has been driven by the same inflationary madness employed by our own government over the last couple of decades. Meanwhile the Japanese are still stuck in a never-ending economic malaise that seems as terminal as a smoker's hacking cough. Canada is our largest trading partner which means their own economy is going to be inextricably linked to ours whether they like it or not (Canada's latest projected GDP numbers are very close to our own, if you were wondering). In short, it seems like a whole lot of other governments out there are pulling the same tricks as our very own not-so-beloved federal institution. And they are not doing a whole lot better at it, at least at first glance. So just how are their currencies doing, by way of comparison? Here's a look at the most interesting currencies as measured by currency trusts issued by CurrencyShares. Currency ETFs are essentially Trusts which can be bought and sold through a traditional brokerage account. They are listed on the NYSE Arca and trade in exactly the same way as an ordinary stock does. The advantage of such products is that you don't have to have a forex or futures account to "invest" (or more correctly, speculate) on the future direction of a given foreign currency. For the sake of a streamlined comparison, all of these are ETFs offered by investment entity CurrencyShares. This article is not an endorsement of the company. I'm merely using a single firm to iron out any possible differences in methodologies used by different companies. Here's the symbol list and the charts. Over the course of the last 365 trading days, it's pretty clear that the Japanese Yen is the king of the hill. It's outperformed everything else even though it's stalled lately in the face of increasing U.S. Dollar strength. The downside of the Yen is that you earn next to no interest on it, as you can see from this Bloomberg government bond table. I don't think 2.2% over 30 years is exactly an inspiring return on your money. 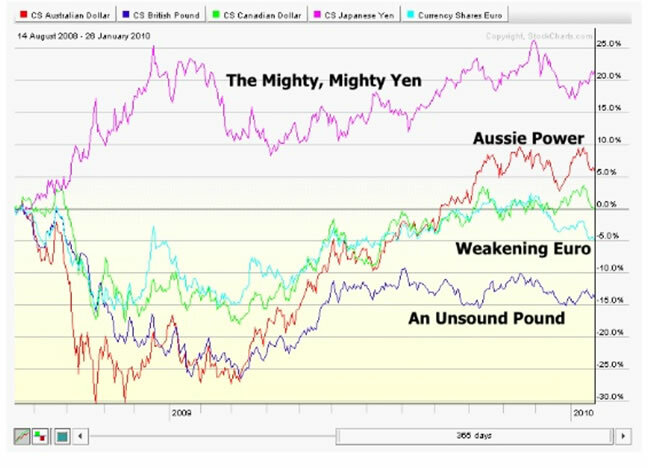 The next best contender is the Australian dollar. It's shown a lot more recent strength after recovering from a heart-stopping plunge nearly a year ago. 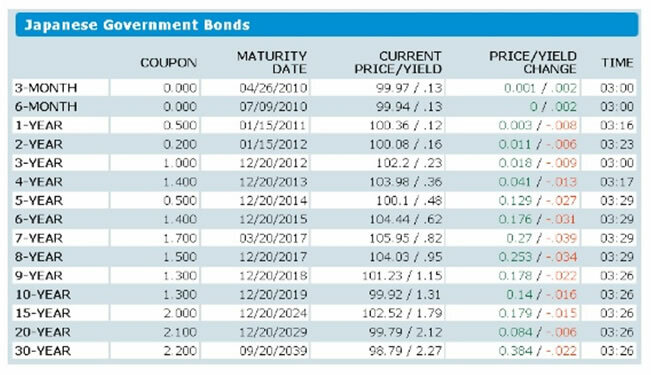 This strength has no doubt been fueled by the attraction of a one-year return of 5.25% and a two year return of 5.75% on Aussie government bonds as shown here. (Note that the coupon rate peaks at 4 years rather than 15 years). Now, I'm not telling you to rush out and buy Japanese yen and Australian dollars (or Australian government bonds), but now you have a pretty good idea of where to begin looking abroad for the most promising non-U.S. investment alternatives. Next week I'm going to expand on this idea a bit more by examining some of the best performing stocks in each country (Japan and Australia) with the working theory that you'll get a double boost from a strong stock plus a strong currency working together in tandem. I also plan to review different asset classes, which offer diversification away from investments which remain dependent upon U.S government actions. As per my earlier columns, I still stand by my position that the U.S. dollar will continue to appreciate against gold and most other paper currencies too, but that this phenomenon won't last forever. Right now that premise is holding up well, so it's worth looking at other currencies we can jump to once the US dollar's run has peaked later this year. Oakshire Financial originally formed as an underground investment club, Oakshire Financial is comprised of a wide variety of Wall Street professionals - from equity analysts to futures floor traders – all independent thinkers and all capital market veterans.